In Anzola dell’Emilia, a small town near Bologna, Carpigiani Gelato University teaches the art of artisan gelato. In four weeks, students not only learn the secrets of gelato making; they also learn how to become gelato entrepreneurs, a good business investment in this time of economic crisis. The course, attracting students from all over the world, is offered in different languages, including English. 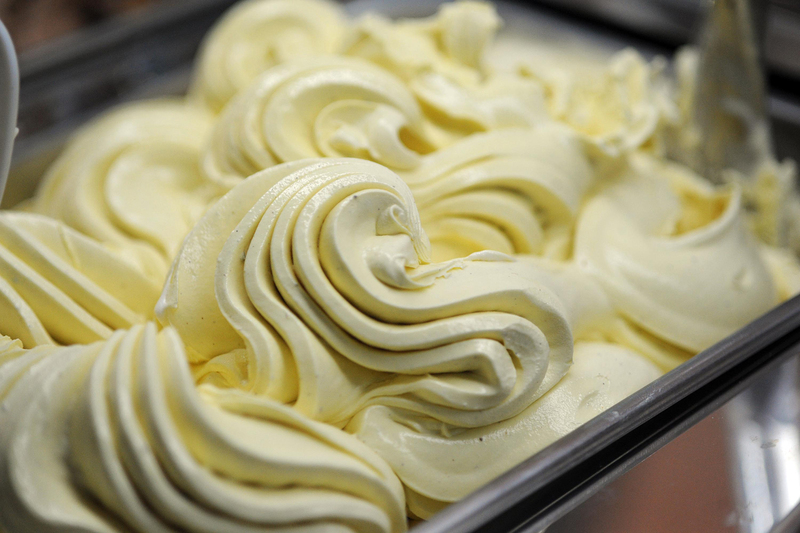 It is not possible to determine the exact date of birth of gelato, but we know that it dates back to ancient times. It is said that the pharaohs of Egypt offered their guests silver cups filled half with snow and half with fruit juices, while Roman emperors loved iced drinks made with snow and honey, with the addition of grape or fruit juice. Modern-day gelato is said to have appeared during the Renaissance in Florence when an Italian architect with the passion for food, Mr. Buontalenti, invented an iced sweet consisting of cream, zabaglione and colorful fruit, which became very popular at the De’ Medici court. From there, it spread to France and then to the rest of the world. Italians have had a strong presence in the development of this product since the beginning, and today artisan gelato is one of the top food products of Italy. Gelato and ice-cream: it’s not the same! The general English translation for gelato is ice-cream, which makes no distinction between industrial ice-cream and fresh, artisan ice-cream. However, there are important differences between the two: gelato is less fat and contain less air than ice-cream and it is served at a higher temperature. These factors give gelato a much richer taste than ice-cream. In addition, gelato offers a wider variety of flavors compared to ice-cream; also, it is made with fresh ingredients in smaller quantities, as it never uses the long-life ingredients that industrial ice-cream, produced in large quantities for supermarkets, employs. Therefore, you should never call ice-cream what is in fact gelato! Carpigiani, based in Anzola dell’Emilia near Bologna, was founded by two brothers in 1945 and has become one of the biggest producers worldwide of gelato-making machines. In 2003, Carpigiani established Carpigiani Gelato University, whose mission is to teach the pleasure and taste of artisan gelato around the world. The course not only teaches the art and craft of gelato; it also provides marketing and management knowledge so students can learn how to start and manage a business. Having a gelateria can be a fruitful business: while 1 kg of gelato costs around €2 to make, it is sold at €15-18/kg. Every year, thousands of Italian and international students arrive in Anzola dell’Emilia to attend the course in the hope of opening a gelato parlor either back home or in some other part of the world where they wish to move. There are people who are unemployed and see this as a way to get a job, but there are also those who have a regular job and wish to change their lives completely. Raffaela Dal Pastro is Italian and wants to open a gelateria in Australia. Michele La Pica (on the right) is from Sicily where he owns a pastry shop. He wants to specialize in artisan gelato. Aldo Paternò from Sicily (on the left) wants to open a gelateria in the village of Gangi, near Palermo. Ferruccio Rivolta has plans to close down his own company in Italy to start his gelato business in Qatar. International students during the internship phase of Carpigiani Gelato University’s four-week course. Students learn the secrets of the perfect gelato. – La Sorbetteria Castiglione. Address: via Castiglione 44. – Stefino. Address: via Galliera 49. – Cremeria Funivia. Address: Piazza Cavour 1/d. – Gelateria Gianni. Address: via Montegrappa 11. – Il Gelatauro. Address: via San Vitale 98. Did you discover a favorite that is not in the list above? Please share! Thanks – I always like learning more about gelato! You’re welcome! Glad you liked it! Next month I will post an article about the first ever “Gelato Museum” scheduled to open in late September in Bologna – should be interesting!